This practical, lightweight cape offers all-round protection for both rider and scooter. Made from waterproof nylon with a chest zip for access. The clear panel enables visibility of the controls and ensures lights remain visible for road use. Shaped to fit both three and four wheeled scooters. 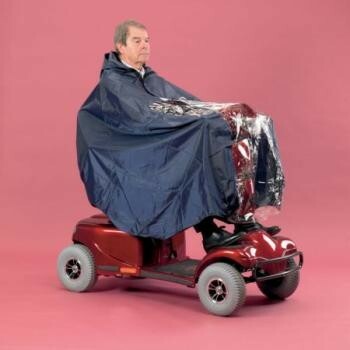 This practical, lightweight cape offers all-round protection for both rider and scooter. Made from waterproof nylon with a chest zip for access. The clear panel enables visibility of the controls and ensures lights remain visible for road use. Shaped to fit both three and four wheeled scooters.